Horn, a one-man project led by Nerrath (real name Niklas Thiele) is somewhat of a legend in German underground black metal. The legend so well-hidden, in fact, that I never heard of Horn before, while Konflikt is the project’s at least fifth full-length. 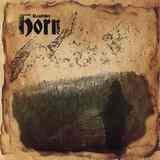 From what I read, earlier on Horn was leaning towards atmospheric and folky side of black metal. Konflikt, on the other hand, is a rather eclectic mixture of styles, and not only in music. Dedicated to some episodes of warfare in various geographical and time spots in European history Konflikt lyrics are delivered in multiple European languages: German, Norwegian, Finnish, Swedish, Dutch. To fully grasp Konflikt’s message multilingual qualities are key, but if you lack those abilities (like yours truly here), then delving into music without expectations or restraint would be helpful. It is hard to predict what the Intro Konfliktor I prepares you to. Monastic chanting can set the table for just about anything, and the first half of the album, from Zangen und Kessel through probably Brandstäbe is along the lines of rustic, archaic and ancient sounding black metal. Electroacoustic guitar cuts through the superdense fabric of fuzzy tremolo on Zangen und Kessel and the closing vibrations reminded me of the older Ruins of Beverast. Vocals delivered from deep cavern, with a cold hand firmly squeezing vocal chords, rolling resonant drums, a number of Finnish ambient black metal bands (like, say, Haive) could also be brought up for reference. At the same time, Blodet eg fekk drukki is undeniably Celtic, much cleaner, including the pained voice, with a great syncopated beat and definitely reminds me of Primordial circa Imrama. Siren-like guitar tone on Konflikt is very definitive, the dark riffs atop the double bass in Brandstäbe incredibly persistent, with leads embedded strategically here and there. It is this guitar tone which makes Konflikt sound practically restless. One part of Nerrath’s brain wants to stew, while the other wants to rock, and it is the rocking part which totally takes over in the album’s second half. Brandstäbe slowly sees Horn move closer to Khold or Vreid, both in rhythm and tone. Basic guitar chord progression of Raatteentien jää begins to grate, but still manages to capture, the voice trying to deliver some cleaner chorals. Yet plunge into primalcy could not be resisted and you would think it is Horna, not Horn, is playing on Fotanglar i trånga grander up tempo rawness dripping over the edge. Buoyed by this mood change Horn just doesn’t seem to stop. The expanse in the sound is now matched with the grit, the aforementioned Khold and Horna are beating up on the atmospherics, all the way until Tunge støvler dissolves back into the Finnish atmospheric nothingness, further represented by the Outro Konfliktor II. Things do come full circle on Konflikt, but you can’t forget there was a roller coaster ride in between. There is great attention to detail on the album. The use of samplers is clever (the Soviet Army march opening up Tunge støvler is superb), the production is riding the edge between legible and raw using just the right balance. If your mind can embrace the multiple facets of black metal genre, you will find a lot of things to like about Konflikt. From rocking and frolicking to pensive and introspective, the album manages to captivate, and that is probably my most flattering compliment I can assign hereby.